Cumberland Sesqui-Centennial in 1937 and the Fort Cumberland Bicentennial in 1955. Cumberland's celebration of its 150th birthday was held from August 8 to 14, 1937. Besides parades and other activities, the outstanding event was the pageant "Cavalcade of Cumberland" held on August 10, 11, and 12. It was held at Fort Hill High School stadium. It was a John B. Rogers production and directed by Chester H. Brooks and others from the Rogers company. Music was by the American Legion Band director Joseph M. Fradiska, and the Community Choir with W. Wallace Ashley, director. Narrators were Miss Lillian Compton and Lewyn C. Davis. The pageant had fourteen episodes, and hundreds took part. It showed Cumberland as it was from an Indian encampment to World War I. 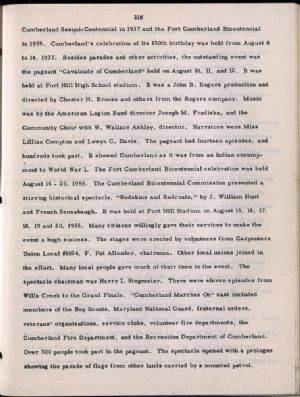 The Fort Cumberland Bicentennial celebration was held August 14 - 20, 1955. The Cumberland Bicentennial Commission presented a stirring historical spectacle, "Redskins and Redcoats,” by J. William Hunt and French Sensabaugh. It was held at Fort Hill Stadium on August 15, 16, 17, 18, 19 and 2 0, 1955. Many citizens willingly gave their services to make the event a hugh success. The stages were erected by volunteers from Carpenters Union Local #1024, F. Pat Allender, chairman. Other local unions joined in the effort. Many local people gave much of their time to the event. The spectacle chairman was Harry I. Stegmaier. There were eleven episodes from Wills Creek to the Grand Finale. "Cumberland Marches On" cast included members of the Boy Scouts, Maryland National Guard, fraternal orders, veterans' organizations, service clubs, volunteer fire departments, the Cumberland Fire Department, and the Recreation Department of Cumberland. Over 300 people took part in the pageant. The spectacle opened with a prologue showing the parade of flags from other lands carried by a mounted patrol.